Kids? Dogs? Boat? Where do you live? RA: No significant other, rolling single. I currently live in Winter Park FL, but am moving back west sometime in 2010. I have a black lab named Hucho, named for the Hucho Hucho (Danubian Salmon). As far as boats, looking at an Outcast PAC 1200, ClackaCraft, Pathfinder flats boat and a beater 17′ Fiberform powerboat named “Chainsaw” that we used in college to fish for salmon in Puget Sound. RA: I started working in a fly shop and as a guide apprentice at 14. Guided all through high school and college. Started Beattie Outdoor Productions right out of college in 2005. So about 13 years. TR: You started out as a guide right? Where? RA: I was born and raised in the Roaring Fork Valley in CO and guided for a number of shops in that area. After college I dabbled a bit in international guiding as well. RA: I’m not guiding in Florida. This is my first year on a poling platform, so there is still so much to learn! I have been entertaining the idea of bringing the flats boat back west and putting some time in on a few carp fisheries that we’ve been fishing over the years… you never know… there could be a market for it. TR: When did you get into video? What brought you to it? during that trip that I realized my passion. TR: Do you remember the first time you thought to yourself I can guide, fish, and shoot great video? RA: At the same time? No, I never came to that realization. Because I can’t guide, fish and/or shoot at the same time. Some people can do it, a few guides are doing it now, but for me I need to really focus on one or the other. If I’m going to guide, I want to devote all of my energy to that. If I’m there to shoot, I’m not concerned with fishing. I’m there to shoot. If I go out with the intent of fishing, I don’t want a camera around. That separation is critical for me to do my best work. TR: Correct me if I’m wrong, but you’ve shot on every continent? Is that right? RA: Yes, I have shot photography on every continent. TR: How many full length videos have you made? RA: Well, full length would be over 60 minutes, so I guess the answer would be 0. Our “Nervous Water” DVD is over 3 1/2 hours of media but that includes many shorts and longer movies. I have made numerous shorts over the years, many of which have won awards in the Drake Mag Film Awards and/or toured with the Fly Fishing Film Tour. I’ve also produced three longer movies: “Nervous Water,” “First Descent Alaska,” and “Bird Chasers.” We are currently working on our new film titled “Off the Grid,” hoping to have it out this summer. TR: Do you do projects outside of fishing? RA: Yes, I have done some work outside the fishing world. As a production company we work on all sorts of random gigs to pay the bills. Actually, I was just on a low budget shoot for a horror film… quite a bit different from what we usually do… but a really fun and creative shoot nonetheless. TR: What’s been your most memorable fishing trip in regards to the video? Why? RA: I spent the better part of three summers filming with Mark Rutherford, of Wild River Guides, in Alaska. We were working on a piece about the 1st recorded descent of a river up there. During that time we traveled through some of the most beautiful scenery I have ever seen. I don’t know if I’ll ever have another experience that will be as memorable as Alaska, there are just not that many places left which are that untouched. TR: How do you feel about using serious gear like cranes and underwater housings? 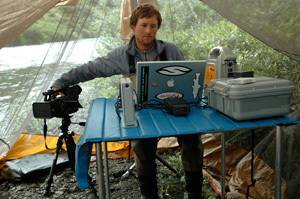 RA: I love gear… but we are always limited as to what we can bring into remote locations. As a result we are always forced to get really creative — which I see as a blessing and not a curse. We’ve made some really killer homemade dollies and zip line rigs in the field. I have a very light weight, low tec jib that has traveled to some very remarkable locations. TR: Do you use underwater gear? If so, what? RA: When it comes to underwater, I’m more interested in filming fish as they exist, uncorrupted in the natural environment. While I used to do it quite a bit, now I could care less about getting a shot of a hooked fish or a fish being released. Anyone can do that. I want shots of the fish before they’re hooked, without them knowing a camera is present. As a result I don’t use conventional underwater housing very often. I love the quality, but they are usually too intrusive for my taste. I’m always playing with smaller helmet cameras and/or looking for the smallest option technology has to offer. everything you own, but what’s in the bag? RA: An avocado, a nine iron, three water balloons and a steak sandwich 🙂 just kidding. RA: I have a pelican case that never leaves my side. It fits in the overhead compartment and usually weighs around 30 pounds. In it you will find two cameras, hard drive, filters and lenses, sound equipment, batteries and a charger. Besides a tripod, it is all I really need. (And a flask with some Crown never hurts). TR: What single tip would you give a person looking to hone their skills as a videographer? Specifically in regards to fishing? RA: Pretend every shot is a still, with a fixed focal length. Work different angles. Be creative. Have fun.